The Mexican/US border tends to produce a particular kind of culture. Those who live on the border speak passionately and often artistically about themselves and others. The border offers a stark context of cultural differences and social inequality, and these are often expressed by a creative flood of expression in music, paintings, and poetry. These artistic expressions are unique to the US/Mexican border, and they demand our attention. Raquel Valle-Sentíes is a border poet who has constructed her cultural identity with a wide range of artistic expressions. She constructs her identities in everyday interactions with the Mexican/US population, often in the terms of “them” and “us.” Her cultural borrowings and reaffirmations of tradition are explicitly expressed in her poetry, paintings and theater. Sentíes was born and raised in Laredo, Texas. She lived twenty-three years in Veracruz, Mexico. She is a mother of five children. After eighteen years of being self-employed in Laredo, she retired so that she could devote her time and energies to writing full time. In 1998 she opened El café del Barrio (The Neighborhood Café) where writers and lovers of poetry meet monthly to share their works. Her poetry has been published by Expresión y Tiempo in Mexico City, Saguaro by the University of Arizona, The Americas Review and The Mesquite Review in McAllen, Texas, and La Frontera of Laredo Community College. She is also the author of two theatrical works: Alcanzando un Sueño (Fulfilling a Dream) was awarded the Chicano Literary Prize by the University of California at Irvine in 1990. La Mala Onda de Johnny Rivera (The Bad Luck of Johnny Rivera) was selected and presented by the Teatro de Esperanza (Theater of Hope) in San Francisco in 1996 and 1997. She has also won prizes for her photography and oil paintings. 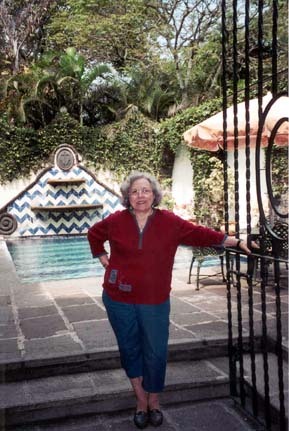 I interviewed Ms. Sentíes on March 10, 2003, on the occasion of her visit as the featured bilingual poet at Weber State University’s Poetry Reading Series. I would like to express my appreciation to the Carl E. Andra Memorial Collection, the Utah Arts Council Literary Arts Program, and Friends of the Stewart Library for bringing Ms. Sentíes to our campus, and, of course, to Raquel herself for affording me the opportunity for an interview. It was a pleasure to spend a couple of days with her as she graciously met with numerous university students in and outside of their classes. Having the chance to spend time with Ms. Sentíes and some of her family members was a memorable occasion. I also want to thank Ms. Sentíes for letting me use some excerpts from a previous interview she did with Randy Koch. Raquel, I have read that people often refer to you as a “border poet” (poeta fronteriza). I’m curious to know how you see yourself. Do you think of yourself as a “border poet,” or would you classify your poetry in a different way? Yes, I definitely think of myself as a “border poet.” The border and I are forever linked para bien o para mal (for good or for bad). My book Soy Como Soy y Qué (I Am Like I Am and So What) is a peek at life on the border. Even the section about Veracruz is colored by my having been raised on the border. For me, border poetry is written by someone who lives on the border and writes about life on the border, whether it is in English, Spanish, or Spanglish. What about those writers who don’t live on the border but write about the same experiences and happenings that you depict and capture so realistically? Other people may and do write about the border, but it will never be the same as those who have or do live here. The border puts its mark on you forever. But that doesn’t mean that just because it’s about what some call “no-man’s land” people other than borderites would not be interested in this literature. I have found that people of many cultures can relate to my poetry and my plays. My task is to help people understand, regardless of where they live and work. I totally agree. When you share your readings, it is very evident that the audience understands and relates to your messages. How would you describe this close proximity, this unique phenomenon, if you will, of Laredo and the border? It should be declared a state in itself. We are different. In a sense it is a “no-man’s land.” It’s neither and both. That seems to be quite a contradiction in and of itself. Let’s talk about your latest collection of poems: Soy Como Soy y Qué (I Am Like I Am and So What). Your poems, as I read them, address all facets of your life, from childhood to the present. When you wrote Soy Como Soy y Qué, did you structure it to address all the different stages in your life? No, Soy Como Soy y Qué was not written with a certain structure in mind. All I was doing was writing down my feelings about the people and the world I lived in. When my friend and editor, Carlos Flores, suggested putting them together as a book, Soy Como Soy y Qué was born. A pattern was obviously running throughout the poems, and Carlos and I brainstormed until we came up with its present format. One very poignant part of Soy Como Soy y Qué is the section titled “Veracruz.” You lived in Veracruz, Mexico, for over twenty years. Twenty-three years, I believe, during most of your married life. You wrote several poems that describe a rather bitter woman abused emotionally and verbally. How and why did you decide to write about those onerous and perplexing experiences? In Veracruz, I wrote some poems when I was depressed, so it was more like an outpouring and less like poetry. A writer friend once said—because I was talking to her about my life over there—”You have to write those stories because those are our stories. There are a lot of stories about things that people go through, but they are not being told. You have to write about it.” That was one thing. I’m talking about abused women because in a certain way I was abused—verbally, of course; emotionally, definitely; physically, some. And women need to know that no matter how bad it is, how awful, or how long it takes, you can remake your life and get out of this horrible situation. Sometimes when you’re in it and you think, “This is never going to end; this is it, how it’s going to be,” you sort of accept it. So I wanted all these women in that same situation to know that it’s not right. I clearly see that outpouring in your poems like “Pregunta Sin Respuesta” (“A Question Without an Answer”), “Retrato de un Hombre” (“Portrait Of a Man”), and “Egoísmo” (“Egotism”). Sometimes, however, the “macho” figure is not portrayed as being domineering, oppressive or despotic, but rather—as in your poem “Pa’chano” (“For Grandpa”) a wise, hard-working and endearing individual whom you admire and miss. “Pa’chano” is about my grandfather. He died when he was 93. I always thought of him as this wonderful old man. He was very conservative in his way of thinking, partly because of the time he lived in Mexico, and having been born there. He came to the United States at age sixteen. He was important in my life as I was growing up. He was a carpenter like St. Joseph. He used to love to go to the Royal Theater downtown when they had vaudeville and light operas. All these things my mother told me. When we were kids, we’d go to the cemetery for the Day of the Dead and spend the whole day there. At these little puestos outside the cemetery, little places where they sold things, he’d buy sugar cane for us and then take out this big knife and peel it. He’d cut a big chunk for all of us. I remember him holding my hand—my little hand in his big hand. I just loved him. I think there are different levels or shades of machismo. The worst, of course, is physical and emotional abuse. I never thought of my grandfather, Pa’chano, as being macho. It bothers me when people say things like that. A guy came in one day when I had opened my business here in Laredo, and he went on and on talking badly about Mexicans. Then, I finally said, “I’m a Mexican, too.” So that poem “Eavesdropping” is my response to all the things I’ve been hearing. Although they are not directed at me personally, it’s my people, it’s my culture that they’re talking about, so it makes me feel bad. And I want these people portrayed as they talk and how they talk about us because a lot of people who don’t live on the border don’t know. Of course, it’s not only on the border; it’s everywhere there are Mexicans—and there are racists everywhere. I overhead those conversations; that’s why it’s called “Eavesdropping.” Why would it be racist when I’m just writing what I heard and what I saw? I can’t expect everyone to like what I write; that’s their prerogative. I’m not racist, so I didn’t write it to offend. I grew up with the word “gringo” and there was never any derogatory tone to it in Laredo. It was just a word to distinguish the English speaking, white, and sometimes blonde with light eyes, people from us. As far as how the gringo is portrayed in my book, I’m just putting down what I see and hear on the border. There is no doubt in my mind that Mexico holds a special place in your heart; however, even after having lived there for over twenty years, you write about feeling alienated and not truly accepted by our Mexican neighbors: “I’m la mestiza, la pocha, la Tex-Mex, / la Mexican-American, la hyphenated / who suffers the lack of her own identity / and struggles to find it.” Do you think this is due to your being raised and brought up on the border? Do you see yourself as having a love-hate relationship with Mexico? I think I have the same love-hate relationship with Mexico that I have with Laredo. Although I have many friends in Mexico who I love dearly, there will always be that difference because I was born and raised on the other side of el Río Grande. There are some things about Mexico that I hate—like its corrupt government. But there are more things that I love. Can you talk a little bit more about your collection of poems Soy Como Soy y Qué and what this collection of poetry means to you? I am very proud that Soy Como Soy y Qué won the prestigious Premio Internacional José Fuentes Mares , awarded by the Universidad Autonoma de Ciudad Juarez in Chihuahua. For the first time in twelve years a woman won. I won in Letras Chicanas and another woman won in Letras Mexicanas. When I won the prize, I said that Chicano Literature was the ugly duckling of the literary world, both in Mexico and the United States, and that winning such a prize would help turn it into the swan it is becoming. Let’s switch gears and talk about two plays that you have written: Alcanzando un Sueño (Fulfilling a Dream) and La Mala Onda de Johnny Rivera (The Bad Luck of Johnny Rivera). Do you write about the same themes that you discuss in your poetry, or do you develop different ones? My plays are completely different from Soy Como Soy y Qué, which was based on my life. My first play Alcanzando un SueZo was written in 1988. It’s a fictional story based on a story that came out in the Laredo Times, our local newspaper, about a family that was found living in Nuevo Laredo [across the border], in an abandoned, roofless building in the middle of winter. The family had come from their place of origin in a cart hauled by a donkey. When the story came out, people began sending money, food, clothes, and they even found the family a house to live in. I never interviewed them. I made up the story of where they lived, what happened to them and why they decide to leave their home to come to Nuevo Laredo and then to try to immigrate to the U.S. We, on the border, are faced with this problem every day. I empathize with their hopelessness when they are caught and sent back. I cry for all those who are so desperate for a better life that they risk their lives over and over as they cross—yes, illegally—into the U.S. I am angered when they are robbed and beaten by their own countrymen, mistreated or killed by vigilantes or the Border Patrol—I think I’ve gotten on my soapbox here. You can cut whatever you want. This play is all in Spanish. This play won 3rd place in the Chicano Literary Contest, University of California, Irvine, in 1990. La Mala Onda de Johnny Rivera is a bilingual play about students in a high school in Laredo, their problems with drugs, dropping out of school, their parents and their love life. It has a bit of magic realism in it when the teacher sprinkles dust from the Mesquite tree blossom on the students so they are able to see what would happen to them if they dropped out of school. In the class they are writing “Calaveras,” which are whimsical and at times critical or sarcastic rhymes about a person. The play deals with death and is written about the Day of the Dead, November 2. This play won the Isadora Aguirre Workshop in 1995. It had a staged reading at the Teatro de la Esperanza in San Francisco, California. How would you characterize your style of writing, and who really is your audience for your poetry and plays? I write in a simple unpretentious way. I want people of all ages to be able to understand and enjoy what I write. Even though some of my poems are more complex than others and some people might not exactly get my meaning, they can still enjoy them because they all tell a story. I want people to see themselves in my poems and be able to relate to them. I want them to celebrate their culture and traditions and not be ashamed of being what they are. I want them to be proud of speaking another language besides English. They appeal to the younger audience, too, because even if they’re not living the same experiences, maybe they heard their moms talking about such a time. And, of course, since I’m writing in Spanglish, they can relate to that. A lot of poems are funny, and audiences laugh. People from all over relate to them, especially “Soy Como Soy y Qué.” They’re interested in how I handle the duality of citizenship, of being both and none. That poem brings out a lot of emotion. People cry when I read it; they like it very much. Spanish and English in your poetry. Talk about why you use this particular technique, this “linguistic crossover,” in your poetry. Is “Spanglish” a real language and legitimate as a linguistic code? When I was growing up, we spoke Spanish at home. I didn’t learn English until I started school at the age of seven. In school, the nuns wouldn’t allow us to speak Spanish. I don’t remember when I started using Spanglish but it was something I was doing by the time I was in high school. It came about naturally and unconsciously. According to Dr. Norma E. Cantú, University of Texas at San Antonio, yes, it is as real as any other language used to communicate—it has a grammar, a lexicon, and is published—in fact it is even taught! Most languages include elements from other languages—for example, Spanish has Latin and English has German, and both have words from indigenous languages. Well, Spanglish uses both the U.S. English and Mexican Spanish codes. Surely, sometimes at least, you must feel torn between writing poems or plays. How do you divide up your time between the two, or are you leaning more towards one or the other? Actually, I feel torn between writing plays, poetry, and painting. Sometimes I think I’m going to be a jack-of-all-trades and master of none. I’m always saying I’m going to stick to one thing, but so far I haven’t been able to do it. Well, since you mentioned your paintings, this might be a good time to talk about them. Many of them focus on women, women Chicana writers to be specific, like Sandra Cisneros, Denise Chavez, Norma Cantú and others. Any particular reason why? Actually, I like to paint women because the female figure is more beautiful than the male figure. And the Chicana writers are important to me because I’m a writer, too. Except for Sandra Cisneros, maybe Denise Chavez, and Julia Alvarez, there has not been enough focus on Chicana writers, so I wanted to do this record of these women who are writing and doing such good work. I admire these women very much. They are strong women and great writers. They were writing and trying to get published at a time when nobody was interested in Chicano literature much less Chicana writers. They struggled and persevered and paved the way for the rest of us. When I saw what they were doing, they gave me the courage to keep on writing and follow in their footsteps. I wanted to honor them, so I decided to paint their portraits. I think you mentioned to me earlier in the day that you like using bright colors in your painting, but this wasn’t always the case. Your earlier paintings were much more mellow and tempered, right? Yes, but those are old pictures of my family, and when I try to do my family, I’m very much about getting a likeness and making it look realistic. When I’m doing the Chicana writers, it’s not a commissioned portrait, so I’m free to do what I feel. And now I’ve gotten looser. When I started, I was scared of trying new things or new colors or new combinations. Then, one day I just did it, and from there on you can see the difference. The Cisneros portrait started this whole new way of painting. Yes, I can definitely see the difference. Are there certain colors you prefer to use to express the freedom that you feel when you are painting? Green and yellow and real bright colors in the background—purple. I don’t like abstraction very much so I would never paint abstract art. I want my audience to know it’s a woman or a man or whatever I’m painting. But I’m freer with the colors, so I can use any color I want, not just flesh colors. And now I use very thick paint. I use a lot of texture, the brush strokes are very aggressive, very powerful. I really made a breakthrough in my painting—finally. Your portrait of Denise Chavez really demonstrates this breakthrough! I’ve always been interested in knowing how a talented writer and painter like yourself decides when to write poetry, paint portraits, etc. Does one of these genres require more effort than the other? Why do all of them? Well, my first love was art. As a little girl, I would stand at a window and trace—that’s the way I started drawing. And, of course, nobody ever said, “Hey, this little girl can draw.” Nobody was interested, so it just lay there. In high school, when I went to Ursuline Academy, there was no art department. Even there I still couldn’t develop it more than what I was doing by myself. And since my dad didn’t let me join the WAVES, he said, “Wouldn’t you like to go to college?” Then I started getting some instruction, but I was only there for three semesters, and I got out to get married. And then, of course, at that time I didn’t know if I was any good or if I would ever be any good. It was just something that I liked to do. And so it stopped right there. In Veracruz, I wrote some poems when I was depressed. They were pretty bad, but I started writing, and I was very much interested in it. And I did it, never thinking I’d ever be published, of course. It was just something I wanted to do. I probably would have continued to do it even if I hadn’t been published. I hadn’t thought of the art again until I returned to Laredo. Somebody who knew that I had been an art major said, “Why don’t you take art? The art will help your writing, and your writing will help your art.” So I took the art course and, of course, enjoyed it very much. But now it’s like the art is taking over. I lose myself when I’m painting, which I don’t when I’m writing. And I think I might be better at painting, so I’ve been thinking about maybe stopping writing and just focusing on painting because I don’t have that much time ahead of me any more. For me, writing plays is easier. I’m good at dialogue. Some poems come out easily with not much rewrite to do, but most of them require many, many drafts. Writing short stories is definitely harder for me than either plays or poetry. I have two that I’ve been working on for a long time, and they’re still not there yet. But I’m tenacious. I hate to leave something unfinished. I’m also trying to write a novel, loosely based on my life in Veracruz. I see that it is not easy being so multi-talented! Is there a common thread that runs through your poetry, theater, and paintings, or do they all have their unique personality and stand on their own? As I mentioned, I was an artist before I became a writer. Some of my art, like the Chicana Writers Series, definitely has a common thread with my writing. I love to paint portraits, and of course many of my family members are my models. I also like to paint the indigenous people of Mexico, especially old people. Their whole life is printed in their faces. I think my poetry and plays both print “lined” faces. I love bright colors, and I use a lot of texture in my paintings, and my writing has “texture” as well. I also did a portrait of Frida Kahlo, and she appears in my new play Path of Marigolds. Marilyn Monroe is another character in this play, and there is a poem about her in my book Soy Como Soy y Qué. So there is that common thread again that slips in and out between the writing and the painting—I like common threads. Professor Tony Spanos (Ph.D., U of Utah) is professor and chair of the Department of Foreign Languages and Literatures at Weber State University. His current interests include Latin American women writers, women border writers (US and Mexico), and the use of technology in distance learning. He has published in Hispania, Letras Femeninas, Foreign Language Annals, Confluencia, Revista de estudios hispánicos and Encyclia.